The book is available here and the chapter (in PDF) is here. The “economic relevance” of universities links, directly or indirectly, university activities with innovations in the private sector (Geiger and Sà 2011). The idea of universities having a distinct regional mission is relatively new. While the original regional policy was that of economic and social equalization within the nation’s boundaries and played a compensatory function for the lagging-behind regions, in the last decade its focus changed substantially. Individual regions are now involved in a “race for innovation” to be globally competitive and attractive. Universities are perceived as being able to contribute substantially to this race, especially that nowadays “each individual region has assumed responsibility for its own development”. Regions must perform to their potential and innovation policies are becoming ever more comprehensive. The broadening of regional policy has implications for higher education institutions; namely, they have to live up to new expectations (Arbo and Benneworth 2007: 19-22). Higher education institutions are not only source of high technology innovations but are beginning to be regarded in a broader perspective: “for example, the new emphasis on social innovation, tourism, the creative industries and welfare widens the academic domain from science and technology and medical faculties to the arts, humanities and social sciences” (Goddard and Puukka 2008: 16). Richard Florida’s ideas of the emergence of “creative class” bring together “work, leisure, community and everyday life” and “where to” is becoming “the most important decision of your life”; a new “geography of happiness” appears (Florida 2002, 2008). Higher education institutions have to interact with an increased number of different communities and each of them has its particular demand on the higher education sector – and increasingly suffer from “mission confusion” (Jongbloed et al. 2008: 304). Research and teaching, as the two major traditional university missions, are being increasingly complemented with the “third” mission, in many contexts defined as the regional mission. Universities were mostly teaching institutions until Humboldt’s reforms in the early 19th century which produced an alternative model, focusing on research alongside teaching. The third mission reflects the change in attitude of universities’ external stakeholders: national and local governments, local businesses and industry, as well as, finally, students and their parents. Higher education is increasingly conceived as a vehicle for economic development of the nation and of the region in whose social and economic fabric it is embedded (see Goddard 2000, OECD 1999). “The third mission” of universities is a relatively flexible term which is understood by both researchers and policy makers through different partially separate, and partially overlapping, dimensions. We suggest five dimensions here, four of which are increasingly linking university science with economic growth: the regional mission (studied in the present chapter with reference to new EU member states, mostly Central European), academic entrepreneurialism, the “service to the society” mission, the civic mission, and innovation. Only the “civic mission” seems directly irrelevant for economic growth. The five dimensions appear in different policy and research contexts and in different higher education systems one (or more) of the five are viewed as dominant, but, in practice, the third mission exhibits a strong bias towards economic interactions, based on knowledge transfer (Vorley and Nelles 2008: 122; in general, though, in OECD recent classification, higher education institutions contribute to regional business innovation, regional human capital formation and social, cultural and environmental development, OECD 2007). Third mission often covers everything besides traditional teaching and traditional research (Jongbloed et al. 2008: 312). Locating third mission activities within university missions is not an easy task. As Benneworth and Sanderson note, “what remains controversial is balancing between teaching, research and engagement, negotiating excellence and relevance, and exploiting existing knowledge without compromising production of new knowledge. Engagement is often a peripheral activity, and unless successfully embedded within a wider institutional change, remains peripheral to the core – teaching and research – activities of the university” (Benneworth and Sanderson 2009: 133). The regional mission means opening up of universities to the regions in which they are located; interactions may differ from cultural to social to political to economic. 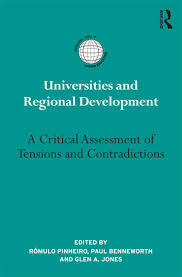 The “regional engagement” of universities studied recently by the OECD (OECD 2007) on the basis of case studies available from fourteen regions in Europe and beyond show that both monetary and non-monetary dimensions can be included as universities are reaching out to the region in several dimensions, from cultural interactions with citizens to economic interactions with local enterprises. Academic entrepreneurialism, the second dimension of the “third mission”, in recent European comparative research (Shattock 2008, Williams 2008, Temple 2008, Kwiek 2008, Kwiek 2009) can be defined as processes through which public universities are seeking financial self-reliance through non-core non-state income, seeking additional funding to be able to institutionally and academically flourish (or to survive). Academic entrepreneurialism covers both prestige-seeking activities and funding-seeking activities, mostly through research – but also, to a smaller degree, through additional (e.g. postgraduate) teaching (see “research entrepreneurism” and “educational entrepreneurism” in an American context in Slaughter and Rhoades 2004: 184-194). European universities can be “measured” against institutional benchmarks found in already existing different European “entrepreneurial” universities. Academic entrepreneurialism can also be studied along Burton Clark’s lines where it means seeking innovation in whatever universities are doing: teaching, research, funding, management and governance modes, human resources etc (Clark 1998). The (American) “service to the society” mission, the third dimension, can show the level of the faculty (or institutional) engagement in local, regional and national politics, legislation, advisory work to public bodies, as well as, increasingly, and much more than previously in financial terms, consulting work (St. John 2006). Service to the society started with outreach teaching (adult learning) and “reaching beyond the walls” and seems to be getting increasingly transformed into commercialized and marketized resource-seeking activities (as regretted by former presidents of Harvard and Stanford, Bok 2003 and Kennedy 1997). The public nature of this mission of the university is being replaced by the “entrepreneurial” motif of seeking new income for the university in the “academic capitalism” institutional framework (Slaughter and Leslie 1997, and Slaughter and Rhoades 2004 for a transition from the “public good knowledge regime” to the “academic capitalist knowledge/learning regime”). The overall Anglo-Saxon trend seems to favor the institutionalization of contacts between universities and their faculty members – and the society or the economy in general, while getting a share of this possibly new funding stream. The fourth dimension of the “third mission” is innovation ­as part of the “knowledge triangle” of education, research, and innovation, relentlessly promoted in the last decade by the European Commission (see the “modernization agenda for universities”, EC 2006). Innovation would refer mostly to research-intensive universities, but it can also be in-house innovation: innovation introduced in universities in different areas, from teaching to project management to human resources management. And finally the fifth sense would be the civic mission of the university: the traditional public good-oriented conceptualization of roles of the university beyond merely teaching and research. The civic mission can be national, transnational (e.g. European) and universal (e.g. global justice or human rights), and it is relevant both in the context of reinvigorating American research universities and in the context of the processes of Europeanization of European universities. The production of university graduates as publicly-oriented, responsible citizens of either the nation-states or such supranational entities as the European Union is one of its leading motifs. The five dimensions of the third mission suggested remain in line with a more general approach in which the university has at least three dimensions to consider when ranking university third mission development: social, entrepreneurial and innovative (Montesinos et al. 2008). All five dimensions of the third mission bring about institutional tensions and policy tensions as their relationship with, or reliance on, the two traditional missions of teaching and research, seem to remain in the making. In new EU member states, the resulting tensions are high as the nature of both teaching and research has been under renegotiations in the last two decades. Postcommunist universities have been undergoing processes of rapid expansion under severe resource limitations, with new national priorities emerging and new European ideas, conceptual tools, and debates in view while reforming closed and elitist systems. Tensions emerged when basically Western European ideas, with regional engagement of universities in the forefront, were being translated into the macro level of national policies and laws on the one hand, and both meso and micro-levels of institutional practice. Conceptual tools of the “knowledge economy” discourse (used by both the European Commission and the OECD) were applied in theory (reforms ideas) and practice (reforms implementation) to postcommunist educational systems functioning in postcommunist economies, in the organizational ecology of postcommunist legal and infrastructural environments.